In the packaging world, void fill products come with a specific use: surface protection, product cushioning or area fill. What makes bubble cushion so effective and popular is that it can be all three. 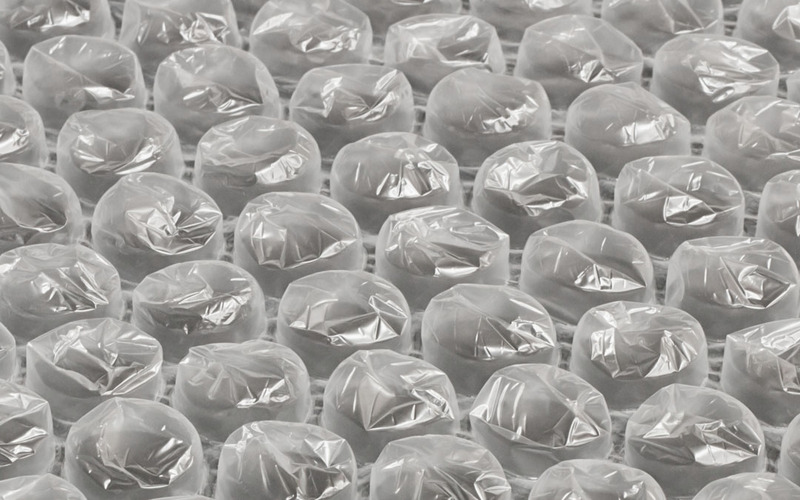 Its air-filled cells easily conform to wrap, pad or fill an area without the need for extra effort—and with the right sized cells, you’ve got a versatile and reliable packaging material. Let’s take a look at the bubble cushion size that’s right for your needs. The most commonly used size, 3/16” bubble is meant for protecting finished surfaces against scratches, dents and chips—while also cushioning lighter items against vibration. It’s the size most favoured by moving companies, due to its versatility and ease of carrying. It’s also most often used in packaging and shipping standard commercial products like digital cameras, small kitchen appliances and more. When listed for purchase, it’s often referred to as small bubble cushion. Best Uses: Moving purposes, protecting glassware and storing family keepsakes. Used for larger or heavier items, 5/16” bubble provides surface protection and shock absorption. It’s ideal for wrapping around bulky items like mirrors and frames, sculpted artwork, oversized hardcover books and other objects that require thicker, more robust padding. It’s also used for shipping parts or components, when other void fills are likely to settle, shift or compress during transit. When listed for purchase, it’s often referred to as medium bubble cushion. Best Uses: Custom products and artwork, or small but heftier components. Intended to be used almost always as void fill, 1/2” bubble is less commonly utilized in commercial product packaging. Its oversized cells are meant to fill the empty spaces in larger containers during bulk shipping of consumer products or grouped components. When listed for purchase, it’s often referred to as large bubble cushion. Bubble cushion is one of those near-perfect packaging materials—designed to give your products the right kind of protection, while also being even more useful and versatile than originally intended. Though there are other void fill options out there, bubble cushion is often less labour-intensive and can reduce your packing times to a noticeable degree. It’s no wonder why bubble cushion’s one of The Packaging Company’s favourite packaging materials—and we’re sure it’s one of yours, too.